Known as the longest and most influential of Islamic empires, the Abbasid Caliphate oversaw the golden age of the Islamic civilization which we will discuss in more details shortly. During most of its early history, it was one of the largest empires in the world, which meant that it had contact with neighbours from both the Far East such as the Chinese and Indians, as well as the Byzantines in the West, allowing it to acquire knowledge from these cultures and evolve further. Following both the Rashidun Caliphate (632-661 A.D) and the Umayyad Caliphate (661-750 A.D), the Abbasid Caliphate (750 to 1258 A.D ) was the third successor to the Islamic ruling. Upon the overthrowing of the Umayyads rulers in 750 A.D, the Umayyad’s family fled to AL- Andalus (the modern day Spain and Portugal) and they ruled the Islamic West for about six centuries. As opposed to the Umayyads who treated the newly converted Muslims “mawali” as second-class citizens, the Abbasid Caliphate differentiated themselves by de-emphasizing ethnic Arabs and recreating the Muslim caliphate as a multi-ethnic entity to include the non-Arab Muslims. They ruled most of the Muslim world at the time covering 11,100,000 Km2 and about 33 million people from the North African region, to the Arabian Peninsula in West Asia and reaching to Iran in the East. The Abbasids were descendants from Prophet Muhammad’s youngest uncle, Abbas Ibn Abd Al-Muttalib, whom the empire was named after. The Abbasids relocated the empire’s capital from Damascus in Syria to Baghdad in Iraq for the sake of being closer to the Persians whom they depended on for support since they made up the largest group of “mawali”. The mother tongue of the central administration as well as the rest of the empire was Arabic. With a period of over five centuries of ruling, the Abbasid Caliphate dynasty had many Caliphs rule the empire; starting with the first caliph, Abu Al-‘Abbas Al-Saffah who replaced the Umayyad Marwan II in 749 A.D. and ending with the last Abbasid caliph, Abu Ahmad Al-Musta’sim who was killed during the Mongol raid on Baghdad in 1258 A.D. 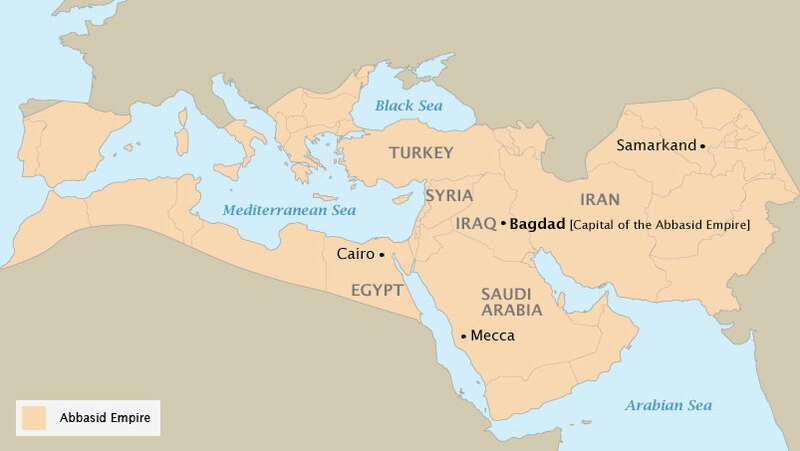 In between the two, there was a total of 37 Caliphs ruling from Baghdad (750 – 1258 A.D ) and after Al-Musta’sim there were 17 caliphs ruling from Cairo (1261 – 1517 A.D). The Cairo-based caliphs were limited in their ruling to religious matters only as we will come to know later. The Islamic rule managed to unify much of the Eastern world, which resulted in the abolishment of many boundaries and thus made the trade safer and more extensive than it had been in a long time. Muslim traders reached the Far East and established trade posts in India, Philippines, Malaya, China and the East Indies. The trade was mostly concerned with importing the basic necessities such as grains, wood and metals. In return, the Muslims had a myriad of products to offer. They exported pearls from the Gulf area, horses and camels from the Arabian Peninsula, in addition to cloth, paper, sugar and even medicines thanks to their advances in the medical sciences at the time. With the expansion of the trading business came the demand for craftsmen of all sorts; leatherworkers, blacksmiths, papermakers, weavers, jewelers and several others. This evident growth in commerce called for a system to govern and ensure that the trading process was executed in a fair manner. Thus, a system was developed were an inspector “muhtasib” was assigned to observe traders and ensure that the proper weights and measures were calculated and given and that any sort of dishonest practice was reported. Their economical dealings were done using the Dinar golden coin along with the silver Dirham and the copper Fals. Several innovations came to life during the reign of the Abbasids, among those was the development of the postal system into a more efficient system that served also as an intelligence system. In outlying provinces, postmasters were the eyes and ears of the government and regular reports were made covering everything from the state of the harvest to the doings of the rebellious sects. One of the fields that reached great heights in the Abbasid era was literature. Names like Abu Tammam, Abu Nuwas and Al-Mutanabbi started to rise and they managed to shed the light on the Arabic poetry with their intellectual abilities in the eloquent art of word-weaving. During the ruling of the fifth caliph in the Abbasid dynasty, Harun Al-Rashid (786 – 809 A.D) the culture thrived and flourished especially in the fields of art, poetry, philosophy, science and medicine which gave this era the title; “The Islamic Golden Age”. The sheer massive size that was under the caliphate ruling at the time allowed it to have contacts with neighbouring yet distant civilizations such as the Persians, Indians, Chinese, Egyptians, Greeks, Romans and Byzantines. This in return permitted scholars to collect and expand the knowledge of those civilizations. The result of this manifested in the founding of the House of Wisdom “Bayt Al-Hikma”, in Baghdad, a sort of an early form of a university that hosted Muslim and non-Muslim scholars and allowed them to gather all sorts of knowledge under one roof and in one language, Arabic. This was the time when major names marked their place in history; Al-Khwarizmi who contributed to Algebra, Al-Biruni and Abu Nasr Mansur who made significant contributions to geometry and astronomy , Jaber Ibn Hayyan nicknamed the father of chemistry and Ibn Al Haitham who made major contributions to the field of optics and the development of the concept of the scientific method. Despite the challenges of ruling a massive multiethnic empire, the Abbasid Caliphate thrived due to the many capable caliphs and their advisers. However, by the end of the eighth century, former supporters of the Abbasid Caliphate started to break away in order to create separate entities for themselves, especially in Persia. The Caliphate ruling had its end coming with the sacking and destruction of Baghdad by Hulagu Khan of the Mongol in February, 1258 A.D, which was an incident that witnessed a great loss of life. After the execution of the last Abbasid Caliphate, Al-Musta’sim, the Abbasids maintained a feeble show of authority from Egypt under the official reign of the Mamelukes, which was restricted to matters of religion. This lasted over 250 years and ended in 1517 A.D when the Ottomans conquered Egypt and the empire officially disappeared with the imprisonment of Caliph AL-Motawakkil III who was taken away to Constantinople. The imprisonment of the last Caliph of the Abbasids marked the end of a total of seven and a half centuries of Abbasid history. Following the Abbasids, the Ottoman rulers exercised authority over yet another powerful Islamic Empire. Abbas, Tahir (2011). Islamic Radicalism and Multicultural Politics: The British Experience. London, UK: Routledge. ISBN 0-4155-7225-8. LCCN 2009050163. Hoiberg, Dale H., ed. (2010). “Abbasid Dynasty”. Encyclopedia Britannica. I: A-Ak – Bayes (15th ed.). Chicago, IL. ISBN 978-1-59339-837-8. Huff, Toby E. (2003). The Rise of Early Modern Science: Islam, China, and the West (2nd ed.). Cambridge, UK: Cambridge University Press. ISBN 0-5218-2302-1. LCCN 2002035017. Kennedy, Hugh N. (2004). The Prophet and the Age of the Caliphates: The Islamic Near East from the 6th to the 11th Century (2nd ed.). Harlow, UK: Pearson Education Ltd. ISBN 0-582-40525-4. LCCN 85016597.